A care package is a thoughtful way to show your love. Whether your senior loved one is at home or in the hospital, customized gifts can be comforting. Think about how your senior loved one enjoys spending time at home and select something according to his or her interests. If your senior loved one needs professional in-home care in Oshkosh, WI, Home Care Assistance is here to help. We are a trusted provider of respite and 24-hour care, and we also offer specialized Alzheimer’s, dementia, Parkinson’s, and stroke care for seniors. Here are a few items you can add to the care package. Your parent will be thrilled by a greeting card with your handwritten sentiment. One that plays music will spark a smile each time it’s opened. However, if your parent is hospitalized, give a regular card so his or her roommate won’t be aggravated by repetitive music. Enclose a magazine with topics of special interest to your mom or dad. If your parent enjoys reading, pack a book in his or her favorite genre. For seniors with impaired vision, buy large print versions. You can also buy an e-reader for unlimited book options. If your parent enjoys listening to music, record nostalgic songs on an iPod Shuffle. This user-friendly device is small, requiring minimal packing space. With attached earbuds, your loved one can enjoy music privately. Crossword and word search puzzles help decelerate brain aging and fortify neural connections by triggering memories. Each word your parent finds will activate his or her brain’s reward center. If your parent likes to make crafts, provide the necessary materials and tools. For example, you can provide the supplies for woodworking, knitting, crocheting, beading, or model making. Put a variety of nourishing foods in a care package. If you’re shipping the gift, add single-serve packages of nuts, whole-wheat pretzels, popcorn, cereal bars, and protein bars. If the gift will be hand-delivered, consider adding mini juice boxes or some fresh fruits. For a parent in the hospital, pack travel-size shampoo, deodorant, and soap. If your loved one wears dentures, add denture cleanser and adhesive. For seniors with permanent teeth, send a toothbrush, toothpaste, floss, and mouthwash. During a hospital stay, hand sanitizer helps keep germs at bay. Give your father disposable razors, shaving cream, and aftershave, and pamper your mother with body lotion. 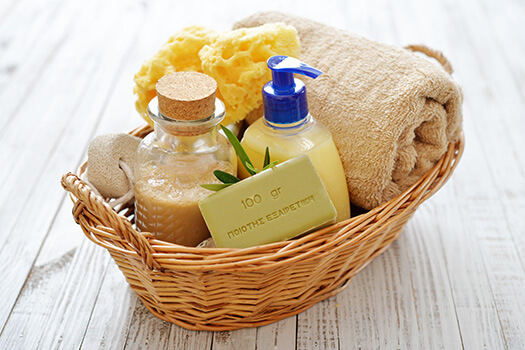 If your loved one lives at home, substitute the above hygiene items with a bottle of perfume or cologne. Seniors often experience insomnia, which is a common symptom of anxiety, arthritis, Alzheimer’s, Parkinson’s, and restless leg syndrome. Nighttime bathroom trips also interrupt slumber. Lack of sleep can lead to a variety of health issues in older adults. Living with a serious health condition can make it challenging for seniors to age in place. However, they can maintain a higher quality of life with the help of professional live-in care. Oshkosh seniors can benefit from assistance with meal prep, bathing, transportation to the doctor’s office, medication reminders, and much more. To facilitate healthy sleep, pack a lavender spray to spritz on linens. To promote quiet and comfort, add a sleep mask, foam ear plugs, and soft socks. Fill a small binder with pictures of friends and family. You can also insert ticket stubs, concert programs, and playbills. If you don’t have the time to assemble a small photo album or scrapbook, place some pictures in a plastic zipper bag or mount a family portrait inside a small frame. Pharmacies and supermarkets carry a vast array of gift cards. Buy one supporting your parent’s interests, such as craft-making or reading. You could give a department store gift card, with an offer to take your loved one shopping, or a gift card to your loved one’s favorite restaurant so he or she can treat a friend to a meal. For families living in Oshkosh, WI, respite care can be a wonderful solution when their aging loved ones need companionship and socialization a few hours a week or just need minor assistance with daily household tasks. At Home Care Assistance, we thrive on helping seniors maintain their independence while living in the comfort of home. To learn about our high-quality elderly care plans, give us a call at (920) 710-2273 today.